Women sit on a bench at a park in downtown Shanghai in this March 16, 2012 file photograph. Policy makers and economists have long been worried about the financial burden of China's expanding patchwork of pension schemes, but those concerns have recently escalated as its rural pension scheme took off in the past three years. QINGHAI, LEDU COUNTY, China - Eighty-year-old Chinese farmer Guo Shuhe receives a state pension equivalent to just $9 a month, not enough to buy a month worth of groceries, but enough it seems, to risk punching a gaping hole in government finances. Guo, though, is fortunate because he also has the financial support of six children. But for younger and future generations of retirees, China's traditional family safety net is disappearing, replaced by state-backed pension schemes tailored for a graying society. The funding shortage is daunting: economists say it could blow out to a whopping $10.8 trillion in the next 20 years from $2.6 trillion in 2010, towering over China's $3 trillion onshore savings, the biggest hoard of domestic savings in the world. To give or not to give, China's pension dilemma is not a sideshow. Good pension coverage will help Beijing remake the world's No. 2 economy to boost domestic consumption, cut export reliance, and dodge a middle-income trap that could ensnare the country anytime in the next two decades. The number of Chinese over 65 years of age, at 123 million, virtually matches Japan's total population, and is rising fast due to the one-child policy Beijing adopted in the 1970s. According to the World Bank, China is ageing so rapidly it grayed in the last 40 years, whereas ageing societies in the United States and the United Kingdom took a century to form. The problem of growing old, fast, is most acute in the countryside, where thousands of villages are "hollowed out" as working adults abandon farms to migrate to cities in search of better lives, leaving the young and old behind. The old-age dependency ratio, or the number of elderly people as a share of those of working age, will hit 34.4 percent in rural China by 2030, compared to 21.1 percent in urban areas, and up from 13.5 percent in 2008, the World Bank said. The cost of an expanding elderly class is hefty. Many analysts believe China's labor force will shrink from 2015, hurt by stubbornly low birth rates and an ageing populace, a trend expected to drive up wages in the world's factory floor in years ahead, and henceforth global inflation. To beat the demographic challenge, Beijing hastened the roll-out in 2009 of a voluntary pension scheme for 657 million rural residents, the equivalent of two United States. To get a minimum 55 yuan a month in retirement, or a tenth of last year's average monthly wage in the countryside, rural workers must pay at least 100 yuan a year for 15 years. In China's richer eastern provinces, payouts are much higher because workers pay more, and local governments and private firms have the means to match payments. In cities, for example, the monthly pension is 28 times higher at an average 1,531 yuan. But whatever the payout, most of the financial burden falls squarely on the government. State subsidies accounted for 61 percent of total rural pension revenues in 2011, with personal contributions making up the rest. "The ageing population in the countryside is rising faster than urban areas, which could pressure the premature rural pension system," said Cai Fang, a researcher at the Chinese Academy of Social Sciences, a respected government think-tank. At face value, China's pension system should not drain state coffers since payouts start low. Yet, an OECD study of global pension systems ranked China's as among the most generous and least sustainable, after the Philippines. China's pension benefit as a share of retirees' average lifetime wages, also known as replacement rate, stands at 78 percent for male workers, above an OECD average of 57 percent, France's 49 percent, and the United States' 39 percent. The replacement rate climbs to 98 percent for low-income earners, much higher than the United States' 52 percent in that category. Early retirement, especially for women, further bulks up the pension bill at a time when people are also living longer. Blue-collared female workers retire from 50 years old in China, a decade earlier than a minimum 60 in the west. And there is the problem of finding the cash to pay for retirees. Beijing only allows rural pension funds to invest in one-year deposits, whose paltry returns lag wage growth. In China's fragmented urban pension funds that manage over 1.1 trillion yuan in 2010, real returns were as dismal as under 1 percent for some. 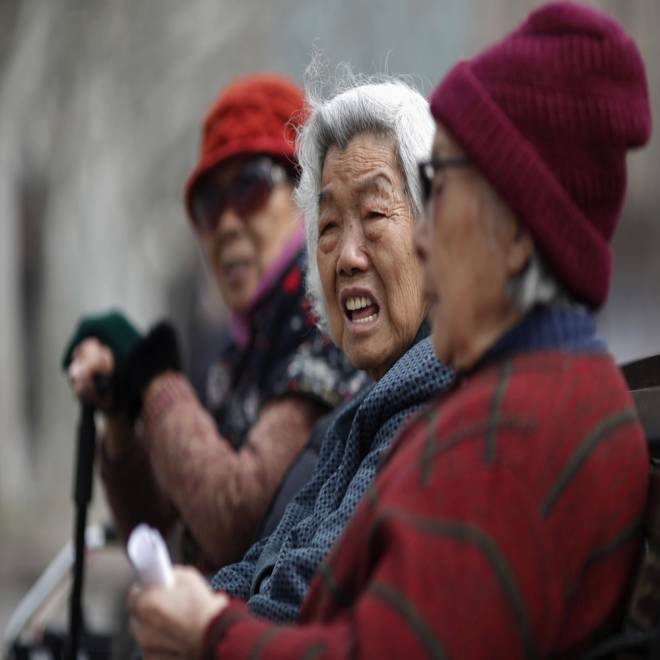 Trapped by rising costs and deficient funding, China spends about 40 percent of state earnings on pension, compared to under 15 percent in Japan and the United States, the OECD said. Stretched, China's local governments are widely believed to be emptying 2.2 trillion yuan worth of pension accounts of young working adults today to pay for current retirees, the Chinese Academy of Social Sciences said. But such financial wizardry does not get rid of the crater in China's pension budget, said economists Ma Jun and Cao Yuanzheng from Deustche Bank and Bank of China respectively. Funding shortfalls hit 16.5 trillion yuan in 2010, the two economists said, and will quadruple to a stunning 68.2 trillion yuan by 2033. That is about 40 percent of China's gross domestic product, assuming its economy grows 6 percent a year. Unless China diverts 80 percent of dividends from listed state firms to pension funds to balance the pension account by 2050, they said, the nation may suffer "enormous fiscal stress". For migrant worker Li Mei, however, the problem is less abstract. Corruption that has pilfered the nest egg of some retirees is her biggest worry. CNBC's Steve Liesman reports why the markets are moving up after reports from Spanish bank stress tests. Also, Ms. Tao Wang weighs in on whether China's economy is in for a soft or hard landing and the FMHR traders pick their favorite China trades.